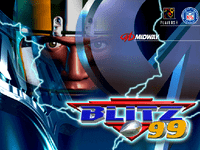 NFL Blitz '99 is the second game in the NFL Blitz series. It was released exclusively in arcades and increased the player count from two to four and boasted many new plays. The game was updated with the 1998 NFL rosters.